LED Strip Lights are now widely used due to the fact that they are very versatile, low-profile design, efficient and easy to use for every lighting application whether commercial or residential. They can provide great accent lighting to an area and are available in different colours and style options. Strip lights do not come with supplied heat dissipation and need to be installed on to a metal surface capable of dissipating heat adequately. Our warranty will not cover LED Strip products not properly installed on a suitable metal surface. Our preferred installation method is in our stylish Aluminium Extrusion products, and these installation instructions are for this type of installation. Please make sure also that you have chosen our waterproof LED strip light if the installation is in wet, damp or overly humid location such as Bathrooms, Laundries and outdoors. 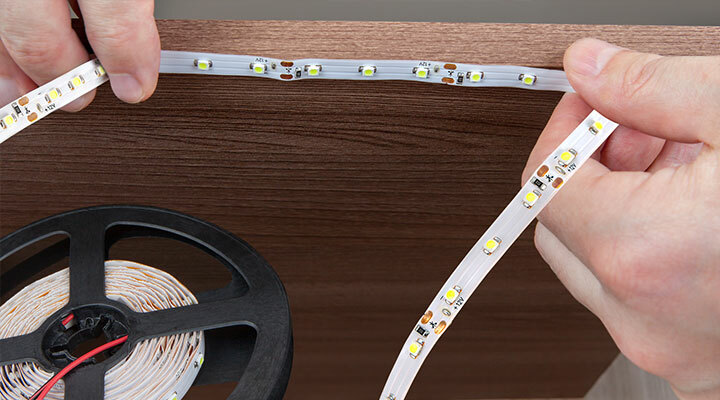 Our LED strip lights come with a self-adhesive tape backing from 3M™. Make sure to firstly clean the surface that the LED strips will be mounted onto from all dust, water, moisture, grease or otherwise. A cleaning agent such as Methylated Spirits or Rubbing Alcohol may be useful, but allow time to dry. You will need to use a dry and lint-free cloth to properly clean the surface. 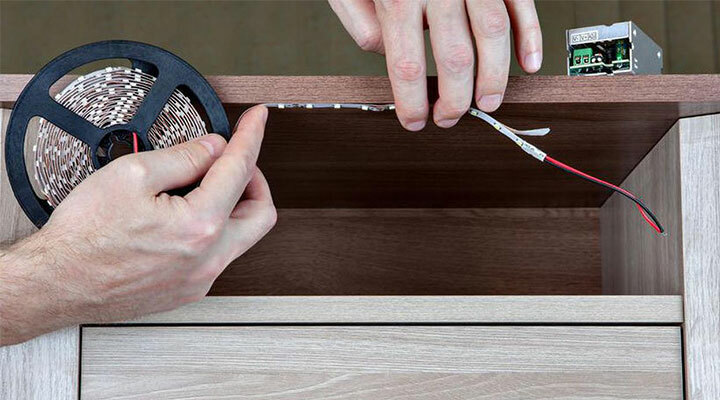 Do not remove the adhesive tape cover until ready to install the LED strip. Some finishes do not bond well with the LED tape backing resulting in the adhesive not working properly, we always recommend dabbing extra adhesive such as Selleys Liquid Nails Clear™ along the strip to safeguard, approximately every 20 cm on each side of the strip will be sufficient in most cases. Note that this product can also be used to prevent water ingress into the extrusion although we still recommend using waterproof strips in necessary locations and not relying on this alone. Make sure you use the correct power supply to avoid electrical failure and to make your LED strip last longer. Using improper power supply would cause low light dissipation and flickering. BoscoLighting cannot guarantee our strip lights that have been installed with an ill-matched driver, We are able to provide advice on suitable drivers and also have several types in stock or readily available. Drivers typically should be loaded with no more than 80% of their rated output wattage, including an allowance for all resistance such as from connections and leads, again, please contact us for advice if required.